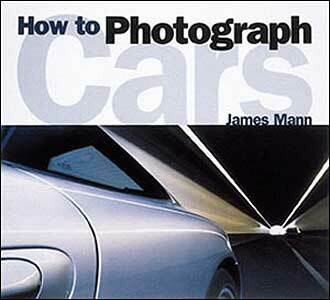 Capture the contours of your car with expert tips from professional photographer James Mann! Everything you need, from selecting equipment and film to static and action photography and studio techniques is bound into this fabulous all-color guide. High-quality photographs serve as examples of Manns techniques, enhanced by step-by-step instruction and images describing how to accomplish each successfully. Highlighted with necessary angles and techniques that embrace a professional magazine feature. Every gearhead dreams of having a great garage-a clean, well-lit, functional place to work on cars, motorcycles, etc. And whether your garage is a simple workspace or a shrine to your toys, theres always something to improve. Inside Ultimate Garage Handbook youll find tips on best utilizing your space and 16 step-by-step projects that will take your garage from average to ultimate and make you the envy of the neighborhood. Author Richard Newton-an ASE Master Technician and author of 101 Projects for Your Corvette 1984-1996, Corvette Restoration Guide 1963-1967, and How to Restore and Modify Your Corvette 1968-82-takes a real-world approach to each project, including cost, time, tools, skill level, and more. 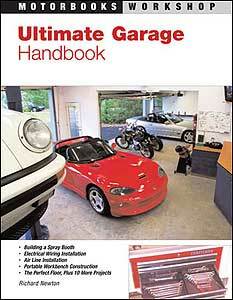 From lighting upgrades, flooring upgrades, and storage solutions to ways to incorporate special equipment like air compressors, heaters, blasting cabinets, and workbenches, Ultimate Garage Handbook is the perfect addition to the hands-on car aficionados library. 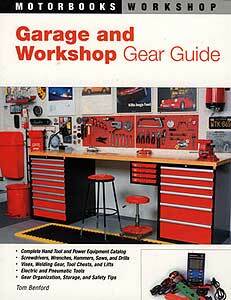 The Garage and Workshop Gear Guide is a one-stop resource for garage gear know-how one book that amateur and expert alike can go to for the facts, as well as a good helping of expert advice, on selecting tools without breaking the bank or wasting time. The book also offers straightforward, honest advice about how to evaluate and select tools according to particular needs. As entertaining as it is informative, Benfords handbook imparts practical wisdom on safety and tool care, making and testing tools, and assembling tool kits to perform various tasks such as restoration, motorcycle maintenance, body work fabrication, and mechanical repair. The Guide covers everything from safety gear and the caste system of tool quality to fasteners and the tools that love them, such as screwdrivers, wrenches, and ratchets; clamps and vises; hammers, mallets, and other persuaders; cutting tools; electrical tools; air tools; measuring tools; welding equipment; lifts; workbenches and storage.